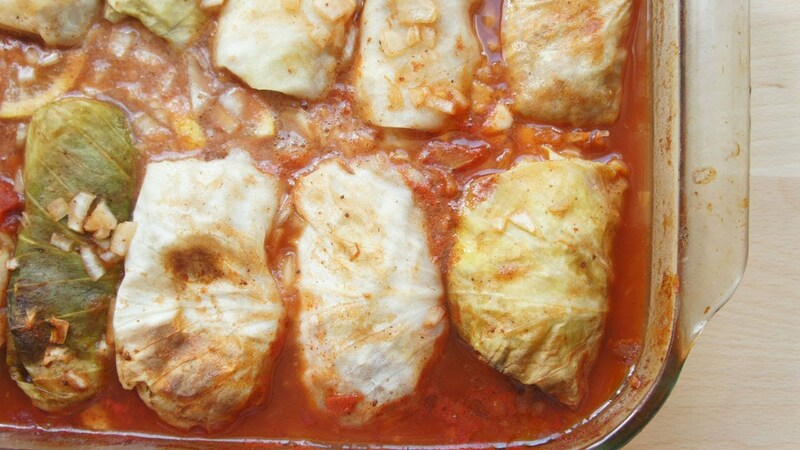 The delicious flavors of stuffed cabbage made easier. My mother’s stuffed cabbage is one of my favorite dishes in the world. She makes it with ground beef and rice and simmers the stuffed cabbage leaves in a rich, savory tomato sauce. I could eat trays of it. My late grandmother used to make a vegetarian version, hers included rice, mushrooms, and barley. The sauce was sweeter than my mother’s, leaning a little more to the Polish side of tradition, where sweet foods are more prevalent. I could also eat trays of her stuffed cabbage and I savored the scent of her cooking it up on special days before Sukkot and Simchat Torah. There are countless delicious ways to make stuffed cabbage, with influences ranging from Eastern Europe to Asia, but all of them are undoubtedly a patchke (a bit of work). The leaves need to be boiled or frozen to become pliable enough for stuffing and wrapping and the entire process from start to finish can take a good couple of hours. It wasn’t until Sukkot of last year when I helped one of my aunts make kraut lokshen, or cabbage noodles, an Ashkenazi cabbage dish made of sauteed cabbage and egg noodles, that I thought of making unstuffed cabbage. Inspired by my aunt’s simple but delicious dish, I realized that instead of stuffing each cabbage leaf separately, I could cook everything together in one big pot, eliminating most of the work, but none of the taste. 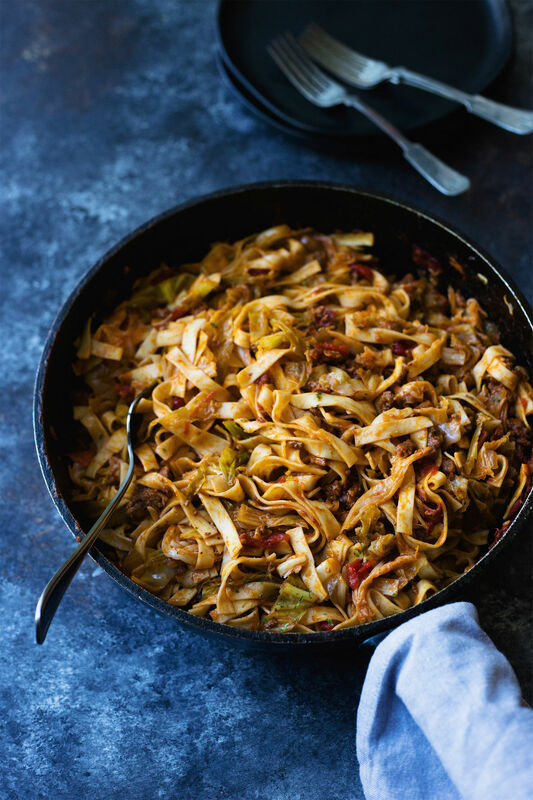 These noodles could never replace stuffed cabbage, what could? But this dish is an easy, tasty twist on tradition for when you don’t have hours to spend stuffing little bundles. Serve them on a chilly fall night, in a cozy Sukkah, or simply when you need a comforting dinner. In a large skillet over medium heat, fry the chopped “bacon” until crisp and browned. Remove and place on a paper towel lined plate. 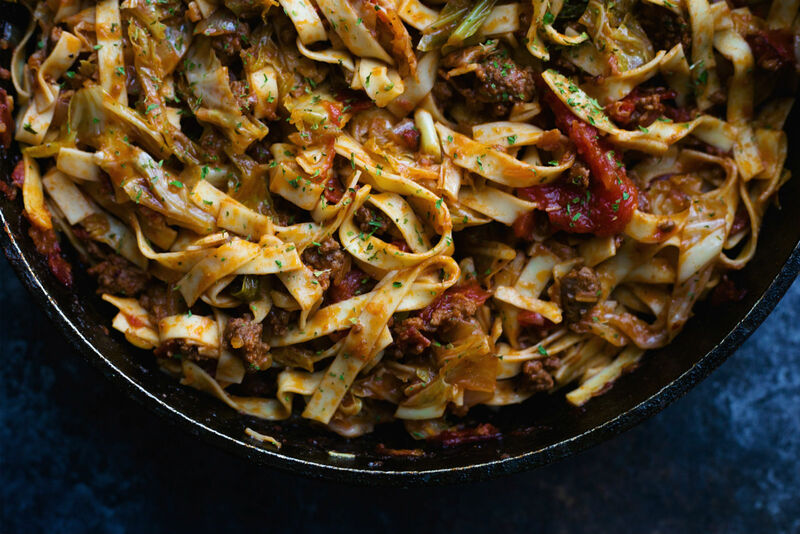 Add the onion, garlic and chopped cabbage to the same skillet with the “bacon” fat and cook for 7-10 minutes on medium heat, until the onion is lightly browned and softened and the cabbage is wilting. Transfer the mixture and set aside. Turn heat up to high and add the ground beef to the skillet. Cook, breaking it up with a wooden spoon as you go, until browned. Add the crushed tomatoes, tomato paste, sugar, crushed red pepper flakes and bay leaves to the skillet. Stir to combine with the beef, cabbage and onion. Add the beef “bacon” back to the pan, bring to a simmer then turn down to medium so it bubbles gently. Cook for 10 minutes uncovered, then simmer for another 10-15 minutes, covered. Remove the bay leaves. Meanwhile, cook the egg noodles according to package directions. Drain and set aside. Taste the beef and cabbage mixture and season with salt and pepper as desired. 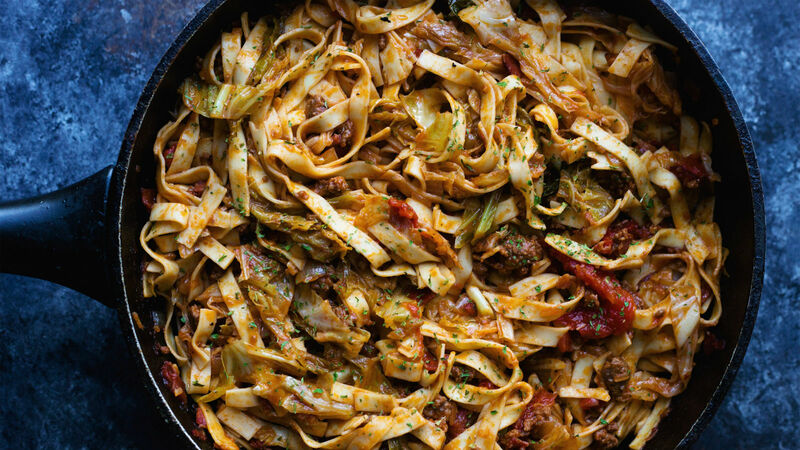 Combine the beef and cabbage sauce with the noodles. Garnish with parsley. Serve. A quintessential Eastern European Jewish comfort food. Set your slow cooker for a hearty, Israeli-inspired dinner.